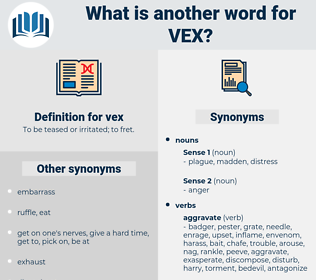 What is another word for vex? To be teased or irritated; to fret. appease, delight, comfort, please, assist, calm, quiet, cheer, help, aid, make happy, soothe, support, mollify, ease. enlighten, honor, solace, inform, oblige, content, console. Yet it is not possible for all men to live so well as never to vex the gods by thought, word, or deed, - through passion or ignorance or carelessness. This was intended to vex me, and I did not even turn my head to him. eat, nag, misgive, eat on. 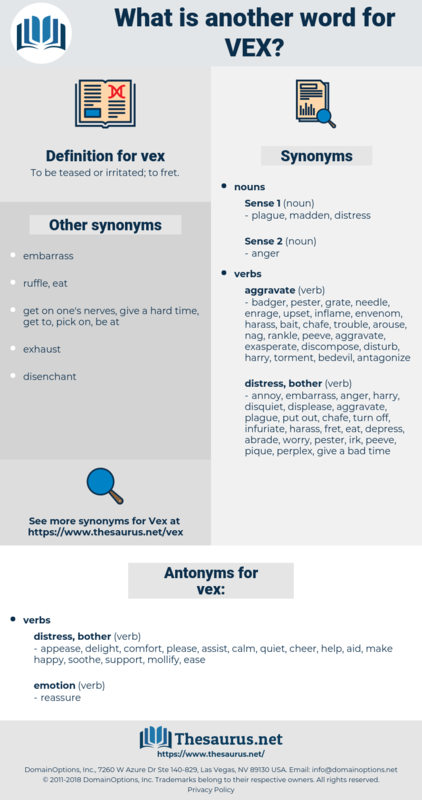 disquiet, distract, unhinge, perturb, trouble, disorder, cark.